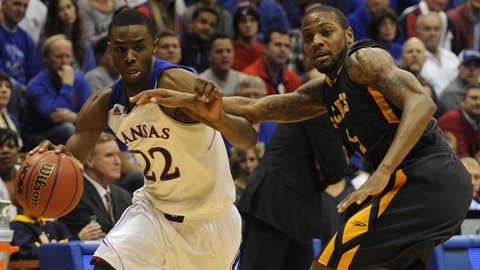 Naadir Tharpe scored a career-high 20 points and handed out eight assists in the Jayhawks' win over Toledo. LAWRENCE, Kan. — Hey, Bill Self loves his point guard. Honest, he does. Why, he even called a timeout 35 seconds into Monday night’s Kansas-Toledo game just to bring Naadir Tharpe over to the bench and remind him just how much he loves him. "WHAT THE (EXPLETIVE DELETED BECAUSE THIS IS A FAMILY SITE) IS WRONG WITH YOU?" Or words to that effect, some of those words more NC-17 than others. Ain’t love grand? "He talked to me about it now. He talked to me about it today. He came (up) to me, got on me (that) that’s what I need to do," Kansas’ junior point guard said when asked about "ownership" following an 93-83 win over scrappy Toledo at Allen Fieldhouse. "I need to be able to lead, and I need to be able to show by example … because, yeah, none of these guys have ever been in this type of situation. "I’ve seen it. I played in a couple (big) games last year. And I just know that I know what it takes. If I don’t go out there (with the approach) that I’m able to make it happen, they’re not going to be able to follow me." Twenty points, four 3-pointers. Follow that. "I was obviously very frustrated with him," Self said after his 16th-ranked Jayhawks won their third straight and moved to 9-3 overall. "Probably as frustrated as I’ve been with a kid to start a game that I can remember. Just not ready to play, in my opinion. Then he actually came in and made some shots … so he showed some toughness coming back and making some shots." Yes, it was the best of Tharpe (eight assists), it was the worst of Tharpe (five turnovers). Toledo (12-1), front-runners to win the Mid-American Conference, wasn’t good enough to counter the length and athleticism of Perry Ellis (21 points, 11 rebounds), Joel Embiid (14, 10) or Andrew Wiggins (20, 5) up front, but the Rockets were just gutsy enough to make the hosts sweat, just tenacious enough to make Team Self work for it down the stretch, nibbling away with a putback here, a 3-pointer there. KU won the battle of points in the paint, 54-30, yet lost the second-chance points race, 19-15. Toledo netted 22 points off 18 Jayhawk turnovers to KU’s nine points off just eight Rocket giveaways, with the hosts picking up just four steals. "I’m frustrated because we don’t give up 70 in our building very often," Self said. "I think Toledo scored easier (Monday) than Duke did in Chicago (on Nov. 12)." But some of the credit for that has to go to the Rockets, who came in to The Phog seventh nationally in points per game (86.4) and 11th in assist-to-turnover ratio (1.65). This had the look, from the very beginning, of a crafty-good kind of tilt, an opponent where the name on the front of the jersey doesn’t impress, but the resume should. Toledo is, after all, what a 12 or 13 or 14 seed in March looks like. Scrappy. Undersized. Tough. Athletic. Chips on all the shoulders. Nice shooters. On Self’s part, that’s another piece of savvy scheduling, another preparatory lesson for what’s to come. Mind you, those lessons can turn out to be a little risky, too. The Rockets drained nine-of-16 from beyond the arc and racked up 32 field-goal makes, two stats that had Self grumbling in the hour after the smoke cleared. "(When) you scored 93, you should win that game by a bunch of points," the coach groused. "And we don’t ever give up 70 at home, let alone 83. Especially when the other team makes (just) 10 free throws — that’s unacceptable." That’s also life in the MAC, home to those 13 seeds in March that you learn to either love or hate, depending on the bracket. Toledo opened the week with an unofficial Ratings Percentage Index rank of 54 and a win at Boston College under their belts. Even if the Eagles aren’t worth a patootie — and, with a 4-9 record through December 29, they aren’t — that’s still an ACC pelt up on that wall for the Selection Sunday committee to ponder. Of course, this was the Rockets’ first test against somebody from the RPI Top 100, let alone the Top 25. They won’t see a team like Kansas again until Bracketville — if they’re lucky — but they hardly embarrassed themselves, either, packing the paint and daring the hosts to beat them from the outside, something everybody in the Big 12 is probably going to try against these Jayhawks, too. "We weren’t going to pack it in on (Tharpe)," Toledo coach Tod Kowalcyzk clarified. "We’ve just got to clean up our defensive mistakes; rotating to a non-shooter and leaving (Tharpe) was an issue." Since a December 10 loss at Florida that was, quite literally, Naadir’s nadir (two points, five assists, three turnovers), Tharpe has changed both his trajectory and that of his team. Over his last three contests, the junior from Massachusetts is 7-for-12 from beyond the arc while averaging 12.7 points, 7.0 assists and 3.3 turnovers. The Jayhawks faced a triumvirate of likely NCAA tourney participants during that stretch in New Mexico, Georgetown and Toledo — and routed all three by an average margin of 16.3 points. 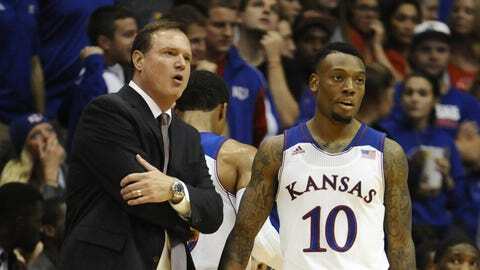 This KU team goes, and will go, as Tharpe and the backcourt go — something Self knows full well. Which is why he sat the junior down for a chit-chat, mano y mano, after the Jayhawks’ setback in Gainesville, to clear the air. "Just Coach and I, we sat down and we talked," Tharpe recalled. "And it was good. It was the first time where we’ve really had a man-to-man talk … (he said) just that we needed to be in this together, him and I. And I felt once we had that talk, things changed for me." For the better, too. Love’s funny like that.